06 July 2016, I finish my work late but we manage to make the approach and arrive at Monzino hut at 21:30. Next day we climb up to Bivouac Eccles (3852m) where we spend the night for acclimatization, as my climbing partner comes from almost the see level. 08 Jully 2016, we start at 02:00 from the Bivouac Eccles and make good progress: 03:30 in Col Eccles, 06:00 at the start of Grand Couloir which is well known for the rock falling. 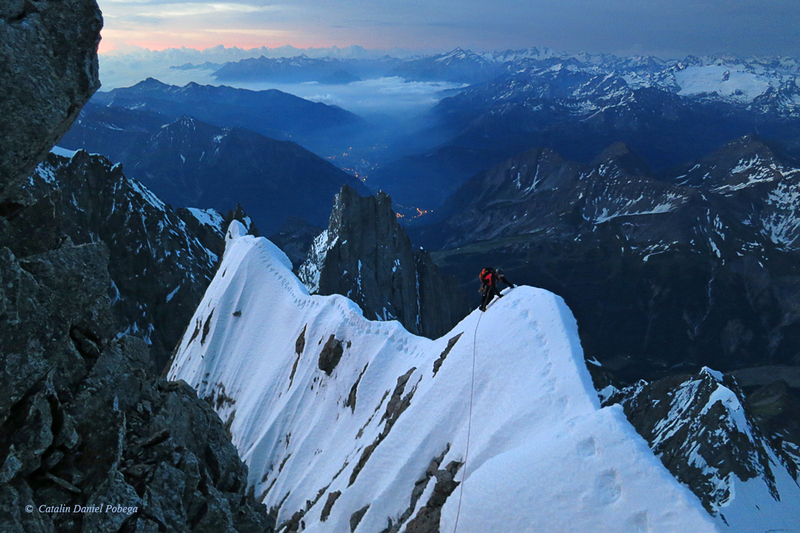 Due to the freezing over the night, we managed to safely cross the Couloir before the sun rise. 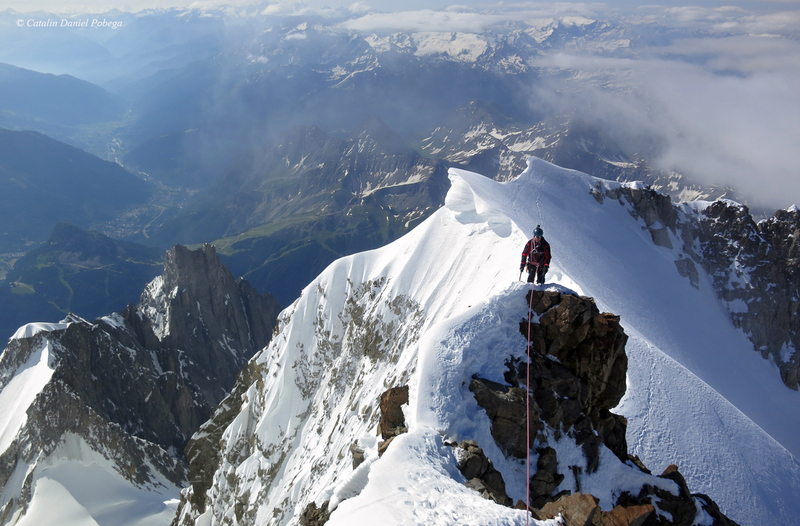 10:30 on the summit of Mt Blanc (4808m) – a relax descend on the Gouter route down to Nid d’Aigle (2370m) – taking the 17:00 tram down for a well deserved shower and dinner in Chamonix. After climbing Peuterey Integral back in 2010 (05-08 July) with Silvia Murgescu, I’ve always wanted to get back to the S side of Mt Blanc which I find so wild and with amazing views. 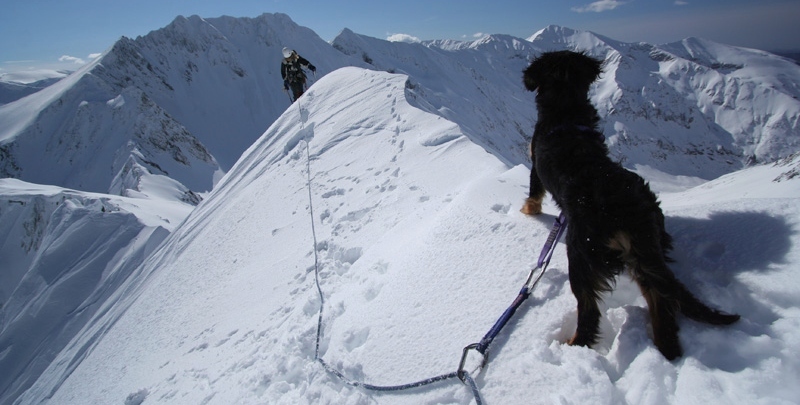 Here I am exactly 6 years later … climbing with another Romanian, Ovidiu Mihail. Ovidiu is very cautious, organized guy who likes to take things slowly. “No rush, no mistakes! Better late, than never!” Like a general in the army, he will consider each detail of the battle. 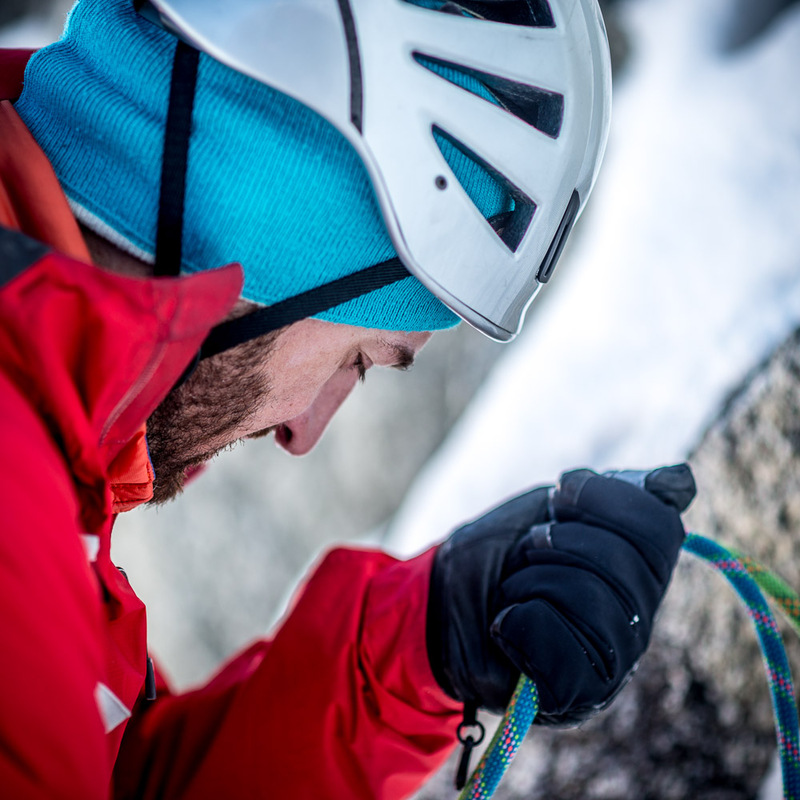 Interesting to see how the attitude of your climbing partner influence your own behavior on the field in therms of “keeping the balance”. 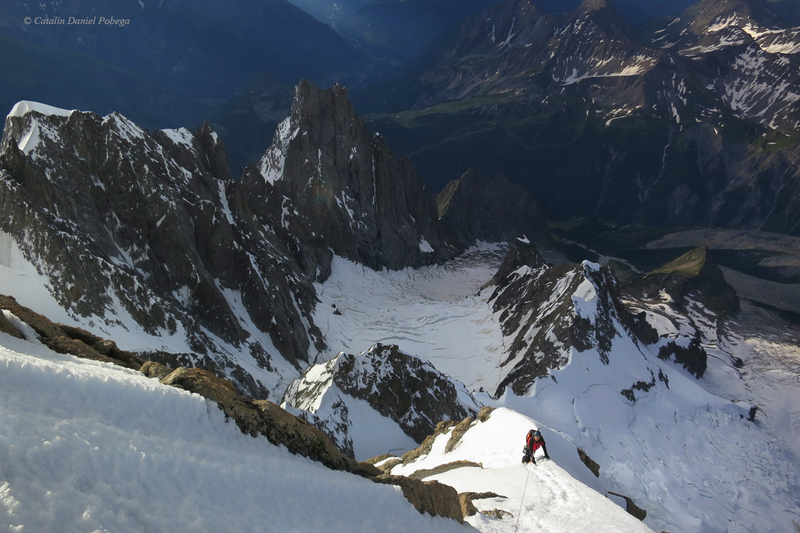 Me: Let’s climb in one day from Val Veny parking to Eccles Bivouac! Ovidiu: 2300 m+ in one day? No way, let’s do the approach in 2 different days, one day to Monzino, second day to Eccles. I am not acclimatized and we need the morning hours to climb up to Eccles, is too dangerous with this snow to do it in the afternoon. Me: What time do you want to start the climb next day? Ovidiu: 02:00! 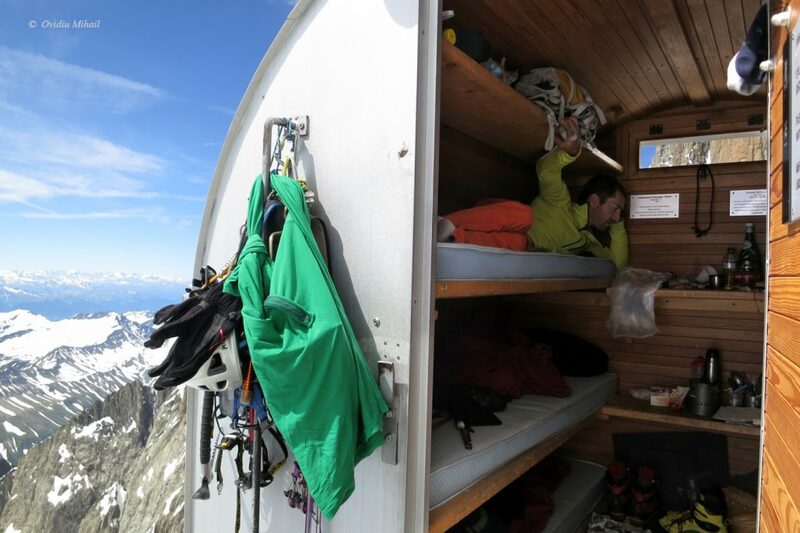 And after summiting Mt Blanc, we can sleep at Vallot refuge if we get there too late. I am in no rush, I am in vacation, let’s enjoy it, not race it. Me(getting mad): Let’s make the rope shorter and move together faster! It is easy terrain here… we are loosing time! Beside this silly game of “keeping the ballance”, some question marks raised in my head. Why do I fight against my partner will and pull the rope so hard? Why do I want to race the other teams and now feel bad because they overtook us? Is it because of the Chamonix style of climbing I did lately? Or is it because I lost something in the process of becoming “a more experienced climber” in the last years? What about now, where is that humble attitude? What changed me?! What have I become? I miss the real feelings I had before: the fear, the weakness, that strange sensation of Someone guiding all my steps, the magic taste of being in a remote place, fully alive enjoying the moment with all my senses… I just miss my Old me! 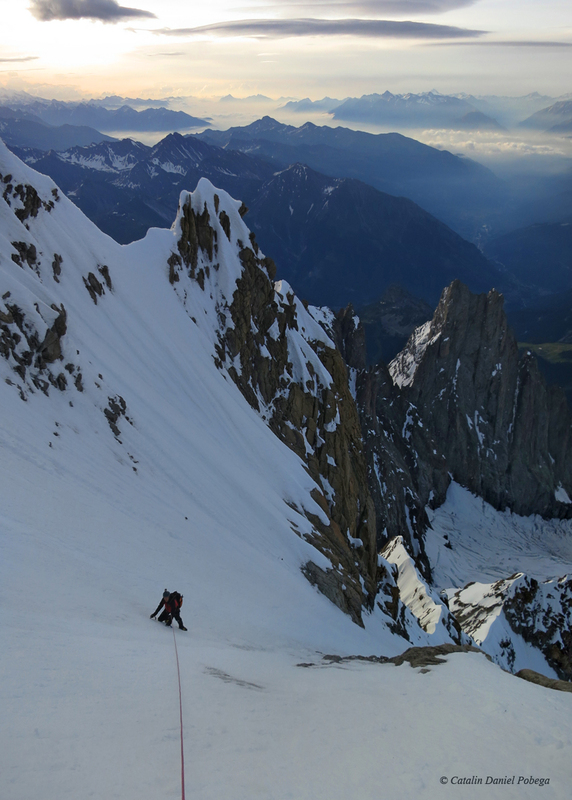 Climbing Brouillard ridge and exiting towards Mt Blanc de Courmayeur, a 50 km/h wind came to meet us. On the top of Mt Blanc we walked between a group. A girl was on her knees, crying of joy. 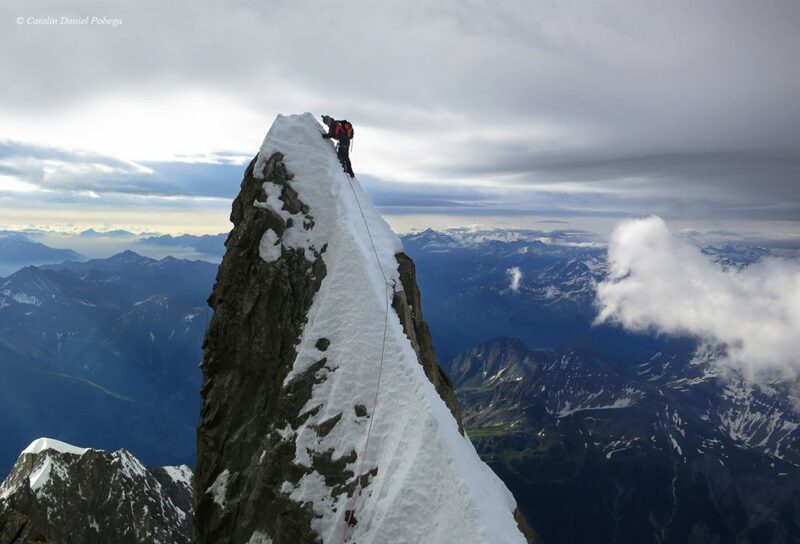 She climbed the ordinary route up to Mt Blanc and there she was… full of emotions, so fully alive, so beautiful! Good food for thinking: Getting more experience by doing hard climbs, steep skiing or long runs will train you to become a Goliath. But never forget that without feelings you are nothing but a robot. Don’t trade your soul. Stay David inside! Stay alive! Sorry for the philosophical divagation, it was in my mind lately. 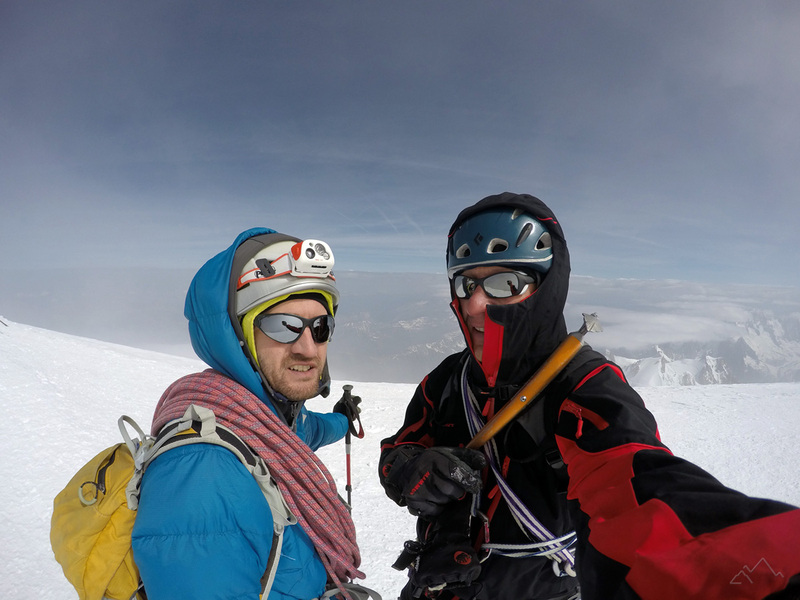 Thanks Ovidiu for such an amazing climb! Never change! Gear we used: one 50 m half rope, steel crampons, one steel ice axe (you will be more happy with a pair), BD C4 (#0.3-#1.0), few slings, 5 long quickdraws. Nice story, great route ( still on the list in my case:-) ), and the “philosophical divagation ” is the essential part, good for final conclusion :-)) Felicitari ! Very nice description David 😉 The feelings change because our attitude changes. Happily, the reverse is possible when we begin to be thankful for everything in our life and when we don’t take anything for granted. Last year I had an accident that slowed me down. I learnt my lessons and I began to rejoice in little things so that I won’t lose again the humbleness and inner satisfaction. Enjoy the route and write with your soul. We will both benefit (you the climber/writer and me the reader/dreamer). Superba descrierea. Felicitări! Si sa postezi mai des.